Steve Jobs passed away on October 5, 2011. Sometimes events swarm around you creating a nexus… a sort of topical ganglion that comes together in your consciousness. This happened to me over the last few weeks. 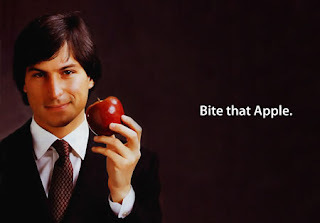 The death of Steve Jobs saddened me greatly. The only computer I’ve ever used is an Apple. I remember the first time I used my little gray box of a laptop and matching printer on location I thought… this changes everything… and that was before the internet!!! Jobs was a true visionary who pressed everyone around him to “Think Different”(click HERE for great video) and push themselves past their perceived limitations. As the news cycle piled tributes upon him, bits of his legend were revealed. For instance, Jobs said nothing would have been possible without game-changing experiences with LSD (one of the things it and mushrooms do is reveal connectedness in all things during the experience) and the whole idea of home computers started with his and Steve Wozniak’s attempts to make phone “phreaking” (stealing long distance) devices. One of his heroes was innovative inventor and businessman Edwin Land, (the man who created the Polaroid Camera and film) who said “Industry is best at the intersection of science and art” and “[A significant invention] must be startling, unexpected. It must come into a world that is not prepared for it.” and “I have long aspired to make our company a noble prototype of industry, penetrating in science, reliable in engineering, creative in aesthetics and wholesomely prosperous in economics.”. He said the Beatles were his business model (“They were four guys that kept each other's negative tendencies in check; they balanced each other. And the total was greater than the sum of the parts. Great things in business are never done by one person, they are done by a team of people.”) but also quoted hockey player Wayne Gretsky ('I skate to where the puck is going to be, not where it has been.' And we've always tried to do that at Apple. Since the very very beginning. And we always will.”). An odd mixture to be sure but you can see the influences in his creative output. 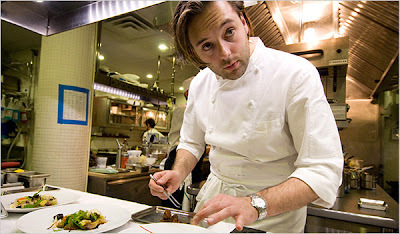 A few weeks later I watched A Matter of Taste –– a documentary about visionary chef Paul Liebrandt. He announced early in the film, “I’m not a nutcase, I’m just an artist.” He put the same passion into creating a plate with a burger and fries (3 kinds of salt for the fries) as he did with a plate of foie gras. To an artist all materials have equal value. I saw Liebrandt develop over a remarkable 10 years of filming –– going through the crests and craters of his career but always sure of his gifts –– even if he wasn’t always sure they would guarantee success. Now at Corton (review HERE), he has hit his stride in his ideal environment and the results are spectacular, resulting in brilliant flights of flavor. In the documentary he spoke of his life-changing relationship with the chef Pierre Gagnaire who also influenced Ferran Adria when he sought him out in 1990. Then last weekend I went to a celebration of Danish food in NYC. Reni Redzipi gave a talk about his food, mentioning Feran Adria and his countries’ neglected wealth of ingredients and traditional food that had inspired him. It all came together at his restaurant NOMA. The right fertilizer, the right soil, the right place and time, check. That got me to thinking about mentors and inspiration in any field, not only the world of food. Not to sound all Yoda about it but it seems to me the best mentors don’t demand that their acolytes stick to the master’s style (so that they become little copies of the master). Rather, in being truly great at being who they are, they inspire the same of their students. Be the best YOU that you can be. Find your true voice to find your best path. Don’t worry about anyone else’s standards –– just be true to your own –– and know inspiration can come from very unexpected places. All of this brings me to cassoulet and the reason that Vanel was on my mind. 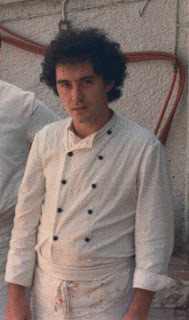 Last spring when I was doing a post on Cassoulet I read about the man that inspired Ferran Adria–– Lucien Vanel. Whoa!!! Who was this guy? It was here Adriá learned about ‘cuisine de terroir” (cuisine of the soil… the taste of a specific place). That inspiration… a meal during an exploratory visit to France in 1984… started him on his path. A quote by chef Jacques Maximin on another French trip stayed with him: “Creativity means not copying.” After this the El Bulli identity began to be forged and he began to “Think Different”. Soon El Bulli was called the best restaurant in the world. I could not find out much about Vanel and what inspired him, beyond his desire to step away from classical French food and honor the cuisine of the Toulouse region (I could only find his cookbook in France and in French so I couldn’t read up on him in time). I do know Cassoulet is a signature dish of the region, made with meat and beans and cooked forever. But Lucian Vanel thinks different. Vanel made an unorthodox cassoulet at his restaurant in Toulouse with cod, beans, seafood sausage, and mussels in a saffron scented fish broth sauced with mustard, egg and cream… nothing like the meaty classic of the region, yet still honoring the spirit of the dish. It’s genius. Vanel is known for saying “Cuisiner, c'est donner –– Cooking is giving”. You’ve got to love a man that thinks that way. 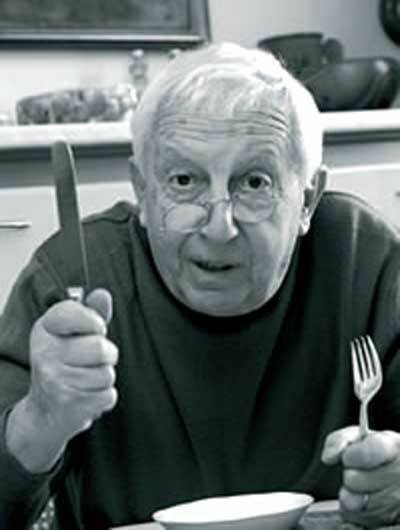 There is now a Lucien Vanel Prize given to the restaurants in Toulouse meant to encourage excellence in the cuisine of the area… a fitting tribute to his vision of honoring the food of the place. This cassoulet is warm and comforting like the porky version but far more elegant. The seafood sausage recipe came from my favorite (but sadly no longer with us) Chanterelle Restaurant in NYC. I’ve been making it for years and love it… usually served with a gorgeous beurre blanc (very popular combination in the 80’s and 90’s). I couldn’t find a recipe for the cassoulet from Vanel himself but did find one by Antoine Caramelli of Le Lautrec restaurant that seemed to have all the ingredients…. I played with it a little and love the result. This version is inspired by the original description in Paula Wolfert’s book… I do not know if it in anyway resembles it… but no matter. It’s a good deal of work, and a little pricey but the result is pure luxury... a creamy, saffron-scented plate of the best of sea and land! This will impress your guests. I used sausage casing to make the sausage but before I got brave enough to stuff my own sausages, I used to roll them in foil and poach them that way. If you do it that way you should skip the browning part. Put the beans, baking soda, salt and vegetables in a pot. Cover with water a few inches above the beans (6 cups?). Cook till soft then drain. This varies with the age of the beans…anywhere from 20 minutes to an hour. Withdraw a cup of the liquid from the beans and add 2 egg yolks stirred into the cream over low heat. The mixture will thicken. Add the mustard and saffron. Brown the seafood sausages in butter. Place the beans on the plate, place the sausages on the beans and drizzle with the pan butter and the sauce. If you’d like place the mussels back on their shells. Sprinkle with herbs. *I save up fish bones and shrimp shells in the freezer and then make fish stock with it and freeze it in 1 cup bags. Basically free to make and better than store bought. You can also get bits from the fishmonger for very little and make it up that way… cooking them with wine, carrot, onion, parsley and celery for an hour on a slow simmer. Put 2 T each of the shrimp, scallops and all of the bass or sole in a food processor and process, add 1 t salt, and egg white then add 1 c plus 2 T cream and process to a mousse texture. Chop the rest of the seafood, the brandy port and cayenne salt and cayenne. Blend. Use a sausage attachment or a pastry bag and stuff the sausage casing… make 6. Or, make 6 rolls and wrap them in foil if you don’t like to make sausages. Poach them at a very low heat for 20 minutes or so. Steve Jobs was such an inspirational human being, leaving behind a tremendous legacy. I am going to have to take that quote and use it for myself: "I'm not a nutcase, I'm just an artist"... fabulous! The cassoulet is simply beautiful! There is something very cheerful about it. Great post, Deana. 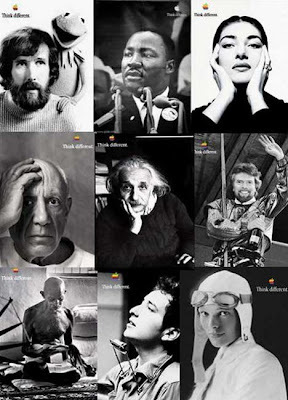 People who think differently are the true world-changers. I'm going to email this post to my hubby who loves Jobs like his own father (incidentally, did you know that Jobs' father was Syrian?). The cassoulet is a masterpiece. The way you capture light in your photos is so inspiring. Can you be just past middle-age and still strive to inspire? I certainly hope so. The cassoulet is indeed different than any I've encountered. As I think of the abundance of Toulouse - it all makes sense - but in a entirely different way. there are very few truly inspirational people who shape the world during one's lifetime but Steve Jobs can surely be counted amongst these few. However, an equally if not more important point which you raise here is that inspiration is also to be found in the everyday, the simple, the menial, the lowly, it is, as you say, often just down to thinking about such things in a different way. Just the words Cod and Cassoulet seemed such a mismatch when we saw the title of the post. But, what a surprisingly good combination and, why not. Different, yes, but then it does move forward the whole thinking around that particular dish. Genius! A wonderful newsy post which I thoroughly enjoyed and then you spoil us with these recipes. All the people you mentioned are passionate about their work and have the gift of creativity which is a winning combination. When applied to even the smallest task can make such a difference. That's a great tribute. I too have only ever had Apple computers. Where would we be without Steve Jobs. Very interesting read, Deana! So many things I didn't know about Steve Jobs. I hope Apple continues to invent and prosper without him. I so want to get a sausage maker attachment for my stand mixer now! Everything sounds great but the seafood sausages sound amazing! Oh my - cod cassoulet? Glad you enjoyed it. I think I would like it too. Cassoulet is one of my very favorite things to eat. I practically survived on it when I was living in Paris and still make it (or a version of it anyway) from time to time around this time of year. Since I love cod, I bet l'd love this version, too. It looks fab. My sister was cooking at Chanterelle in the period you mentioned - I think it was before she moved to the original Daniel. The dish looked wonderful as well! A wonderful tribute to Steve Jobs and the Vanel dish. I've never had cassoulet but you make it look really good. So, fish stock is like chicken stock: free if you're willing to freeze the "garbage" parts of the food. Wonderful information! And this looks like a couple of great meals, as usual. Fantastic! Inspiration is the magic elixir of life, and both Jobs and this beautiful cassoulet are evidence of that! This is an excellent recipe! Well done. I've made seafood sausages before but I poached them in saran wrap. Worked. I like the comment by Wayne Gretsky. Never read that before. It's probably how we should lead our lives. A step ahead. This is a super post about living life differently, or marching to your own drummer. It doesn't always lead to the success Jobs had, but it certainly gives satisfaction. Jobs was a visionary but he had his bumps in the road as well. Perseverance is the answer. This fish cassoulet is a delight and the seafood sausage perfection. What a photo, Deana. Great read, as always. I am tempted to say I wish more people thought differently, but then if everyone did ... it would thinking the same? lol. Conundrum. Incredibly elegant dish here - you think different, one of the reasons I love you! I recall unfondly my first experience with fish sausage (cod and carrot sausage from our local fishmongers in Cheshire) and I had guessed before scrolling far enough that a pescatory mystery bag was about to come up. I'm still not sure how to feel about them, but I would certainly give it another try, and, you're right, this is a rather more elegant presentation than the porky version. It's just that, at the risk of being contrary, as with Steve Jobs, in all truth (and yes, this makes me a real heretic, and it's okay) I kinda like the way things were already - porky cassoulet and no iPods.